In today’s article, we’ll be sharing one of our favorite reports: A weekly performance heat map. 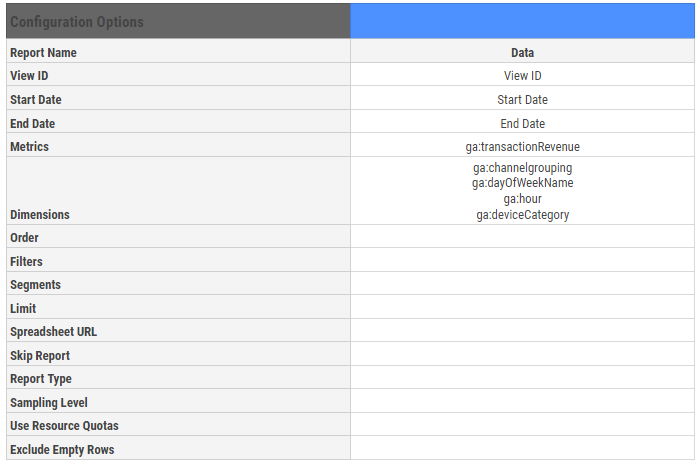 To create the report, we will be using the Google Analytics plug-in available on Google Spreadsheet. If you are new to this, we would kindly advise you to find out more on Google help or to check out our previous articles related to this specific question. Although the template is shared with you here (Link to the template), we do believe it’s necessary to explain a few steps that would allow you getting the most out of the reporting possibilities. We’ll be using only these ones for now to keep the report as simple as possible. Do keep in mind that it is perfectly possible to combine more than one, in order to add more layers to your analysis. Once your report is configured, you just need to “run” the report to access to the next step. We’ve tried to keep the report creation simple: Name the tab, select a channel and pick a device. The name should be “data” by default. However, you can play with the template as much as you want: add tabs to the report configuration or change the different elements set initially. The only thing that we will ask you is to add any variations to their dedicated cell. We have created dropdowns to reduce the risk of misspellings. If you don’t select any, you will have all the available data appear at once. The channels displayed are those from the default channel grouping. If you add any, If you add any, you should do so on the dedicated “data validation” tab. When to launch a campaign? When to spend more aggressively? On mobile? On Desktop? When to close the campaigns? Playing with the starting and ending dates on the report configuration allows you comparing performance year to year or month to month. The template doesn’t include this option, so please do not hesitate to get in touch if you’d like to have a more customized solution. Depending on your KPIs, it can be interesting to frequently compare your conversions and your revenue. Knowing when you get conversions is good, but knowing when you get most of your revenue is more important. To facilitate the readability of the report, we have added some conditional formatting rules. The rules are set to represent the “weight” of each cell. You can choose different percents to adapt your analysis. How does the conditional formatting work? Conditional formatting will show how each cell contributes to the total. Please bear in mind, that you need to select a value in each section to make the conditional formatting working. Please do not hesitate to comment or get in touch if you want more customized solutions.